Splash-Less Bleach delivers a more controlled pour resulting in the same powerful clean as regular bleach but with less spills and splashes. With a thicker formula and easy to pour bottle, there is more control, less drips, and less waste. Splash-Less Bleach can whiten dingy fabrics, remove tough stains, and clean and deodorize other household surfaces. 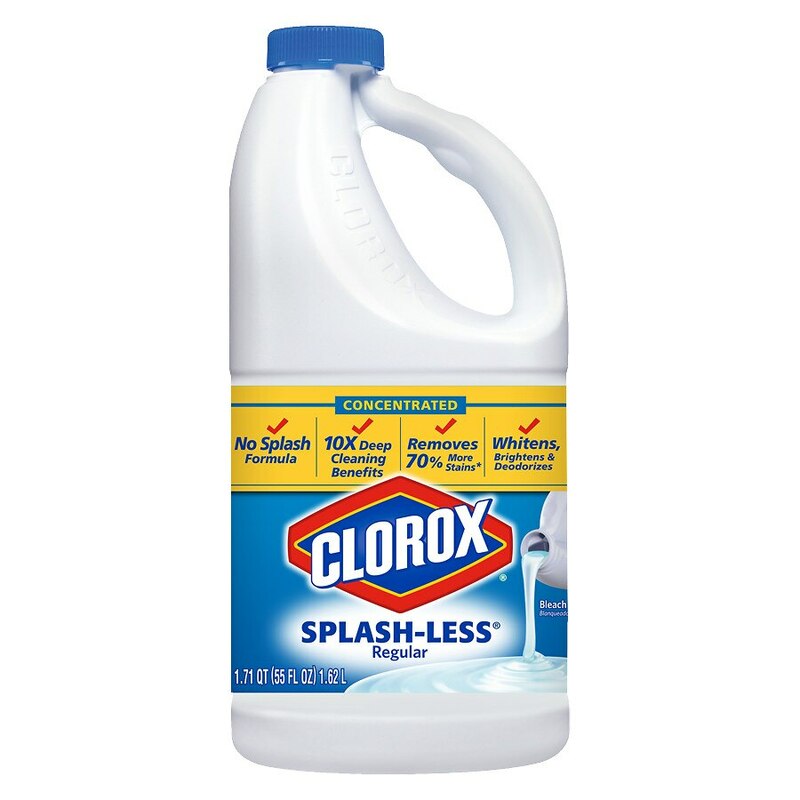 Clorox bleach is great to use for everyday cleaning and seasonal cleaning needs, including spring cleaning and back to school. The concentrated bleach comes in a smaller and easy to use bottle with an easy to grip handle to prevent messy spills. This sodium hypochlorite bleach can be used in both standard and high efficiency washing machines. Contains no phosphorus. *vs. detergent alone in HE machines. Not for sanitization or disinfection. To sanitize and disinfect, use Clorox Regular Bleach. For laundry: Bleachable fabrics: Avoid bleaching wool, silk, mohair, leather, spandex and nonfast colors. 1/2 cup bleach, regular or HE washing machines. For cleaning and deodorizing: Floors, tiles, bathtubs, showers, kitchen sinks, nonporous toys. 1/2 cup bleach, 1 gal. water. Instructions: Pre-wash surface, mop or wipe with bleach solution. Allow solution to contact surface for at least 5 minutes. Rinse well and air dry. Keep out of reach of children and pets. Do not use or mix with other household chemicals such as toilet bowl cleaners, rust removers, acids or ammonia-containing products, as hazardous gases may result.